Passengers on the Purple Line running from Bang Yai to Tao Pun stations. The Mass Rapid Transit Authority of Thailand (MRTA) has forwarded a plan to the Transport Ministry on the Blue Line train service between Tao Pun and Bang Sue stations to fill a gap in a section known as the “missing link”. Planned to be run by Bangkok Expressway and Metro Public Co (BEM), the section would tackle the missing link between the Blue Line, which ends at Bang Sue station, and the Purple Line, which runs from Nonthaburi to Tao Pun stations. The two lines are supposed to be connected but a missing link remains. Prime Minister Prayut Chan-o-cha issued an order in July to use Section 44 under the interim charter to accelerate the work processes for the connection between the two routes. On Thursday, the premier expressed his frustration over the slow progress in addressing the problem. MRTA deputy governor Peerayudh Singpatanakul said yesterday the plan to construct the missing link has been forwarded to the Transport Ministry for deliberation and will be further presented to the cabinet. 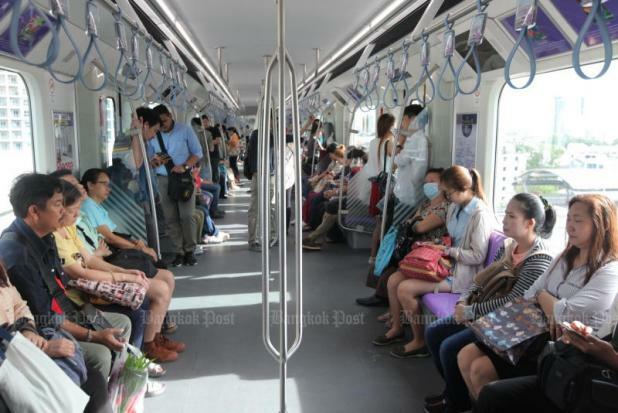 Once approved by the cabinet, the MRTA will hire BEM to install the operation system and the service could be launched in August next year, he said. MRTA board chairman Yodyuth Boonyatikarn said earlier that it would take about six months for BEM to instal the operation system after the contract is signed and another two months for a test run. BEM will be paid 693 million baht for installation of the system and an annual 52 million baht for running the service. The contract would last only two years, pending further negotiatiosn on the Blue Line extension on the Bang Sue-Tha Phra and Hua Lamphong-Bang Khae routes, according to Mr Yodyuth. An MRTA source said the agency’s board agreed earlier to split the missing-link section from the contract covering the whole extension of the Blue Line. The agency plans to sign the hiring contract with BEM to run the service and propose the issue to the Transport Ministry. However, the ministry brushed off the proposal, insisting the MRTA has no authority to sign the contract, and such power should rest with a joint committee under the 2013 Private Investments in State Undertakings Act, the source said. This led to the delay in the operation of the missing link because the panel is also taking care of the whole extension of the Blue Line, the source added. Meanwhile, MRTA deputy governor Pakapong Sirikantaramas said the CKST Joint Venture has submitted the lowest price in the bid to construct train maintenance and car-park buildings for the Orange Line electric rail route, linking the Thailand Cultural Centre and Bangkok’s Min Buri district. The group, comprising Ch Karnchang Plc and Sino-Thai Engineering and Construction Plc, bid 4.9 billion baht. The joint venture edged out Italian-Thai Development Plc and Unique Engineering and Construction Co in the bidding.